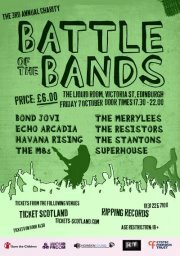 The 3rd annual charity ‘Battle of the Bands’ takes place next Friday at the Liquid Rooms to raise money for Save The Children and the Cystic Fibrosis Trust. The headline acts for the night are: Bond Jovi, Echo Arcadia, Havana Rising, The M8s, The Merrylees, The Resistors, the Stantons and Superhouse. Half the money raised on the night will go towards helping Save the Children set up FAST (Families and Schools Together) groups across the UK, which aim to break the link between poverty and low levels of education, encouraging parents to play an active role in supporting their child’s education. The rest of the money raised will go towards the Cystic Fibrosis Trust. The event takes place from 5.30-10pm and at just £6 a ticket, it’s definitively worth a look at. Tickets are available now from Ticket Scotland and Ripping Records, online at http://www.tickets-scotland.com and by phoning 0131 225 2564.